For some reason, I love to drink Gatorade. Not sure how I got hooked on it but probably when I played hockey and was always thirsty. 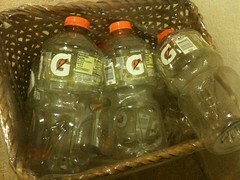 Gatorade seems to be the only beverage that would quench my thrist and it has a taste, unlike water. It even tastes good at a warm temperature so that means I can drink it at any time. So, I looked it up on Wikipedia. Robert Cade, Dana Shires, Harry James Free, and Alejandro de Quesada were the medical researchers, at the University of Florida, who created the original Gatorade thirst quencher in 1965. The Gators football coach, Ray Graves, was frustrated with the performance of his players during summer practices and asked the team doctor for his insight. The doctor referred the matter to Cade and his research team, who formulated a mixture of water, sodium, sugar, potassium, phosphate and lemon juice. The drink is now known as Gatorade in honor of the football team, the Gators. The football team credits Gatorade with their first Orange Bowl win over the Georgia Tech Yellow Jackets in 1967, and the drink became an instant phenomenon. Yellow Jackets coach Bud Carson, when asked why they lost, replied: “We didn�t have Gatorade. That made the difference.